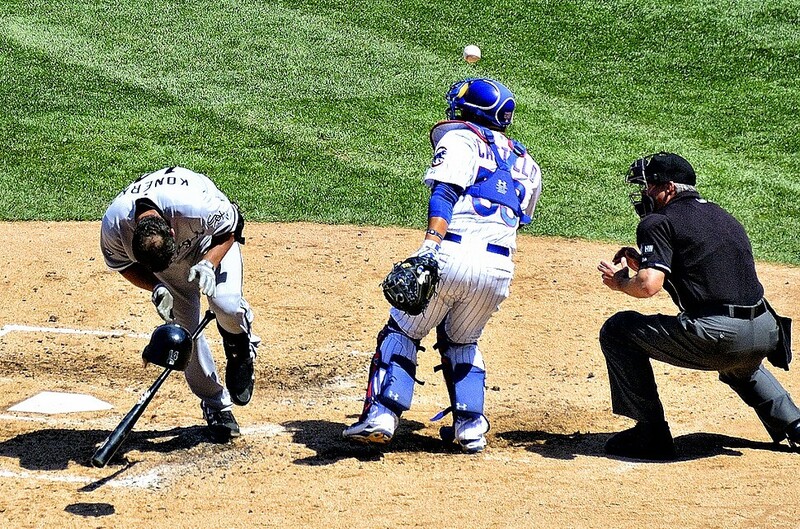 The White Sox and Cubs have taken their lumps so far this season, but especially the Cubs—aside from this Jeff Samardzija beaning of Paul Konerko. Most baseball teams passed the quarter mark of the season earlier this week, making it a good time to assess our teams' progress. Or lack of it. Sorry about that, Cubs. Not that the Cubs' struggles have been at all surprising. New brain trust Theo Epstein and Jed Hoyer admitted early on the Cubs were likely to go down before they began the slow rise to a championship, and they all but guaranteed that by bringing in innings eaters like Chris Volstad and Travis Wood to fill out the starting rotation. (They've turned out to be the flesh-eating bacteria of innings-eating starters.) The Cubs also suffered the indignity of being swept by the White Sox at Wrigley Field last weekend. With the Cubs idle and sitting on a nine-game skid Thursday, the Sox did them the favor of beating Minnesota, meaning the Cubs can now boast they're only tied for the worst record in baseball with the Twins at 15-29. That's a pace to lose more than 100 games. It also means my prediction that they'll win more games in the second half than in the first half is looking pretty solid. Speaking of predictions, I picked the Sox for first in the American League Central, and I'm standing by it. The 11-8 win over the Twins Thursday gave them a series victory over a division rival and moved them ahead of .500 at 23-22 as they try to make up ground against first-place Cleveland starting tonight at Sox Park. Still, the Sox will have to do it without opening-day ace John Danks, out with a stiff shoulder, and will instead toss rookie left-hander Jose Quintana against the southpaw-averse Indians. By the way, in regards to my other bold preseason prediction, that Adam Dunn will hit more homers than the Detroit Tigers' Prince Fielder this year, Dunn has doubled Fielder so far, 14-7.